Veryl Goodnight has been sculpting since 1973. She is one of today's best known sculptors of Western and animal subjects in bronze. Descended from Charles Goodnight, the legendary Texas cattle baron, Veryl is an artist whose work reflects the American West and highlights the pioneer ideal. Raised near Denver, Veryl had formal artistic training that was greatly influenced by the beauty and freedom of Colorado's Rocky Mountain wildlife and her keen interest in horses. As a child, she was only able to dream of having a horse of her own. This yearning became the impetus for her art, filling her with a passion to draw horses and even sculpt them in snow. Veryl works exclusively from live models and has a special stage in her studio for the animals. 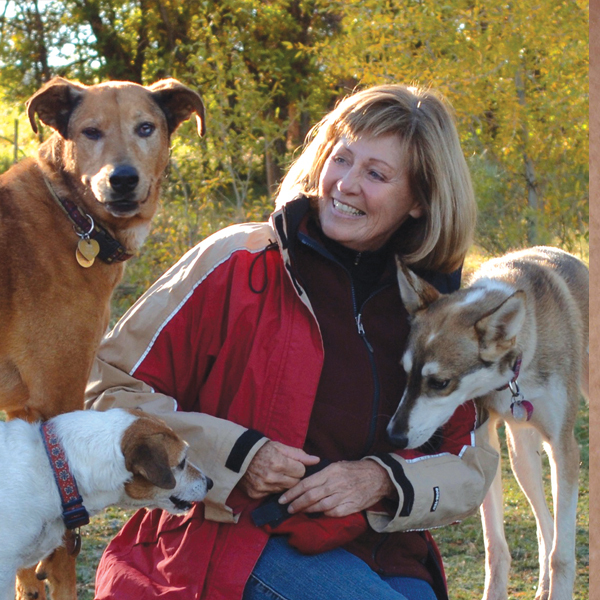 She has raised many of her animal models including bison, deer, elk, goats, sheep, prairie dog, coyote and bear. Her work evolved over the years from sculpting only animals to sculpting people and animals. Veryl depicts this companionship in a way consistent with her philosophy toward nature's creatures. The scenes are gentle and caring with the animal subjects shown as friends and equals. This ideal is beautifully represented in her "Women of the West" sculpture series, which Veryl began in 1984 with "Cares For Her Brothers". This life-size bronze is located at the Denver Zoo and Brookgreen Gardens in South Carolina. There are now eighteen sculptures in the "Women of the West" series. "I'm interested in women who are close to the animals and the land. I focus on the 1800's because animals were so integral to daily life." Veryl is one of the foremost equine sculptors in the United States. She is a sought after instructor, and teaches once a year at the Scottsdale Artists' School and the Fechin Institute in Taos, New Mexico. Her equine bronzes range from miniature to monumental. Many of Veryl's monuments are in museums and public collections throughout the United States, Europe and Japan. "Paint Mare" and "Filly", commissioned by the American Paint Horse Association, was dedicated at the Cowboy Hall of Fame in Oklahoma City in 1988. In 1989, The Lely Resort in Naples, Florida commissioned "The Freedom Horses", which depicts five over life-size running horses. "Spring and Sprite", a mare and running foal, was purchased for the Old West Museum in Cheyenne in 1999. Veryl is proud to also have "No Turning Back" at the Old West Museum. This life-size bronze is of a pioneer woman standing by a wagon wheel, looking over her shoulder. She seems to know that once she had started the journey west, there is 'No Turning Back'. Her largest work to date, "The Day The Wall Came Down", a monument to freedom, portrays five horses jumping over the rubble of the collapsed Berlin Wall. The collapse of the Berlin Wall on November 9, 1989 was a moment of joy shared around the world, captured by the artist in this tremendous sculpture. There are two castings of this monument, one located at the George Bush Presidential Library and the "sister" casting is on display at the Allied Museum in Berlin, Germany. Each sculpture is 30 feet long, 18 feet wide and 12 feet high and weighs approximately 7 tons. The German casting was delivered by the U.S. Air Force on the 50th anniversary of the Berlin Airlift, installed by the German army, and unveiled by former U.S. President George Bush in July of 1998. The sculpture is a gift of friendship from the American people to the people of Germany. In October 2000, Veryl was the recipient of the Central Intelligence Agency's "Agency Seal Medallion" in recognition for her vision of freedom for "The Day The Wall Came Down." Veryl's work has been profiled in the books "Leading The West" (Northland Press 1997) and "An Encyclopedia of Women Artists of the American West" (University of Texas Press, 1998). She has also been featured in all major American art magazines, and exhibits in prestigious shows, such as Artists of America, Denver, CO; Great American Artists, Cincinnati, OH; Masters of the American West, Los Angeles, CA; Cheyenne Governor's Invitational, Cheyenne, WY and the Northwest Rendezvous, Helena, MT. She maintains membership in the National Sculpture Society, Society of Animal Artists, Northwest Rendezvous, American Academy of Equine Art and is a Master of the Artists of America. Most recently, Goodnight was awarded the People's Choice Award for her sculpture "Back From the Brink" at the 2001 Northwest Rendezvous show in Helena, Montana, where her quick draw painting captured the second highest bid at $1,700. In addition, September/October issure of Art of the West featured her work in an article focusing on recent works, including paintings. Veryl began her career painting and later transitioned into sculpture to better understand anatomy. In no time at all, she was hooked on the medium. Veryl has recently returned to painting, and has taken advantage of the workshop opportunities to study with Dan Gerhartz, Tom Browning, Andrew Peters and Howard Terpning. She lives just north of Santa Fe, New Mexico with her husband Roger Brooks and their menagerie of animals. Their favorite pastime is riding their horses through the surrounding mountains and arroyos.